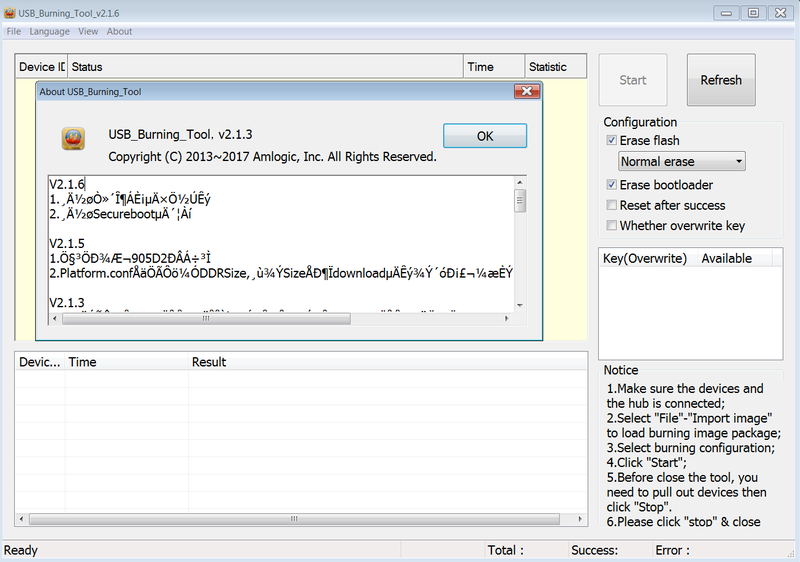 Amlogic’s USB Burning Tool is a Windows based tool used to upgrade devices based on Amlogic processors over USB. Most devices now implement OTA firmware updates, so in most cases it is not necessary, but if your device has problem to boot, or want to update to a beta software it is often required, although now it is possible to use a micro SD card with Burn Card Maker. USB Burning Tool is often updated to fix bugs and support new processors, so you may want to check out you have the latest version to avoid any potential issues. Tanix provided a link to USB Burning Tool v2.1.6, which you’ll also find on mirror 1 and mirror 2. 2. Increase the DDRSize in the Platform.conf configuration and determine the size of the downloaded data according to the size, compatible with the old chip. If you need instructions you can follow our USB Burning Tool How-to. defenitely. I got strange behaviour with mine with s912 too, but then used this tool and voila, fixed. the burn tool is losing the device at first reboot after erasing the flash stage. unfortunately this prevents me from upgrading the firmware. any suggestions ? Somebody wrote open source tool, but now not find it. Easy USB protocol. Source in Amlogic U-Boot. I’m expecting a new Khadas audio board soon, that could be a good opportunity to try this new tool. This Linux tools works for all Amlogic SoCs.